Rakhine ethnics lost their land in the Alethankyaw crisis that broke out in Rakhine State in 1942 in which Bengalis attacked, murdered and coerced them into leaving their homes. We will never let such a terrible occurrence happen again. 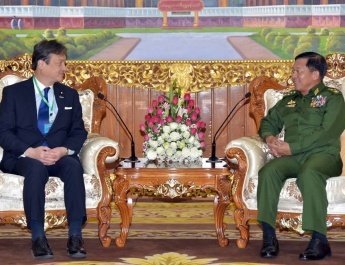 The Tatmadaw will fully safeguard the sovereignty of Myanmar, without allowing any damage to it. 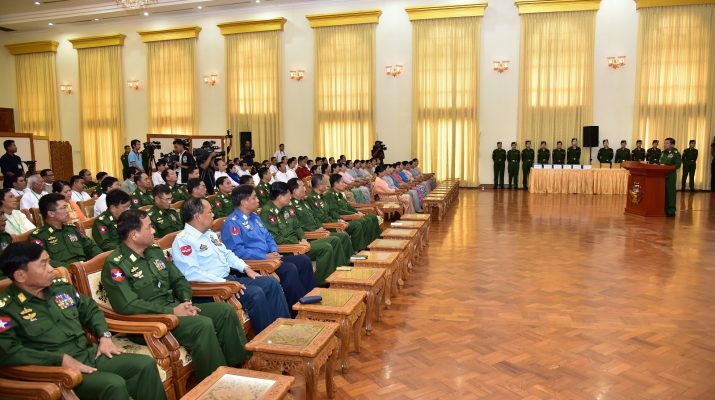 In addition to the security forces, the entire government institutions and the entire people must defend the country with strong patriotism, said Commander-in-Chief of Defence Services Senior General Min Aung Hlaing at the ceremony to make cash donations for security personnel and state service personnel who risked their lives while shouldering national defence and security duties and ethnic natives who fled their homes due to brutal attacks of ARSA extremist Bengali terrorists at Bayintnaung Villa, here, this morning. In his speech, the Senior General recounted the terrorist attacks of ARSA extremist Bengali terrorists in Buthidaung and Maungtaw region, saying, extremist Bengali terrorists launched synchronized attacks against an army unit headquarters and 30 police outposts from different directions with superior force beginning 1 am on 25 August. It was a well-prepared plot. Because of the ARSA extremist Bengali terrorists’attacks on the security forces, destruction of bridges with explosives and arson attacks, 11 members of Myanmar Police Force, two Tatmadaw men, one staff of Immigration and Population Department, one health staff and 14 local ethnics lost their lives and two ethnic people were missing. The terrorist used blades and spears in viciously butchering the victims. Eight bridges were destroyed and 2,707 houses from villages burnt down. In explaining the root cause, the Senior General said that the extremist Bengali terrorists blamed religious persecution for their retaliatory attacks. The Senior General said Myanmar ensures freedom of religion. Christians represent six percent of the population and Islam four percent. They have been living peacefully in the country since years ago. There were Muslims but there was no problem. But the situation in Buthidaung and Maungtaw regions is different. Bengalis from those regions were taken into the country as manpower from Bengal region during the colonial era. Their population increased through various means, and later they attacked the local ethnics. During the Alethankyaw crisis in 1942, over 20,000 ethnic Rakhine people were slaughtered. Bengalis after murdering ethnic Rakhine people seized their land and villages and lived there. There is no oppression or intimidation against Bengalis in Rakhine region. The only measure security forces are taking is to ensure everything is within the framework of the law. The root cause of the recent crisis is the well-planned terrorist acts that came together with the denial of legal verification while ignoring the 1982 Citizenship Law. The act of using religion as a tool to make instigation and violent attacks is totally unacceptable. People living in Myanmar must obey its laws. The Bengali problem was a long-standing one which has become an unfinished job despite the efforts of the previous governments to solve it. The government in office is taking great care in solving the problem. As regards the term Bengali, the Senior General said as the Bengalis in Rakhine State came from Bengal region during Myanmar was under British colonial rule, they have been termed Bengalis throughout the successive eras. It is known that in India people living in Bengal are also called Bengalis. The Bengalis calling themselves Rohingya has become a national cause. 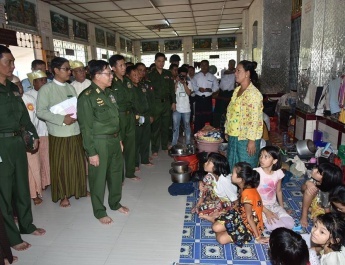 So we openly declare that “absolutely, our country has no Rohingya race.”Regarding the security of Rakhine State, the Senior General said, he himself visited Buthidaung and Maungtaw regions after the incident that happened in October 2016. The Tatmadaw sent military units there to conduct area clearance operations after giving the information to the government. As the region became stable, the operation was stopped in February 2017 and participated only in security affairs. In the ongoing incidents, the Tatmadaw had to get involved as the strength of police forces alone could not defend. It was also officially permitted by the government. Without the Tatmadaw involvement, the situation could worsen. 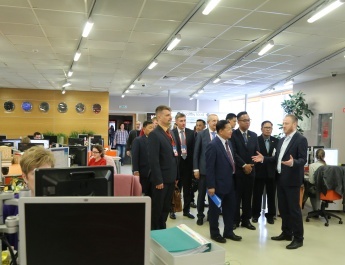 The situation of 1942 and territorial loss are unacceptable. 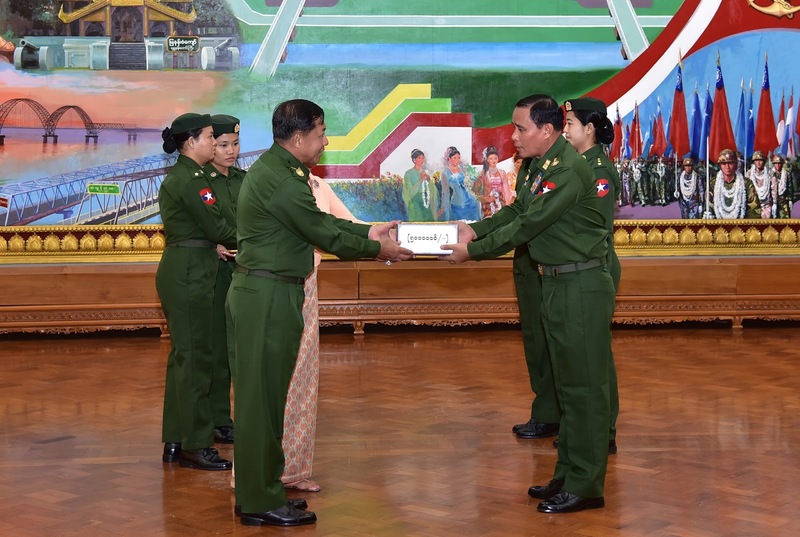 The Tatmadaw will do its best to perform national defence duties. 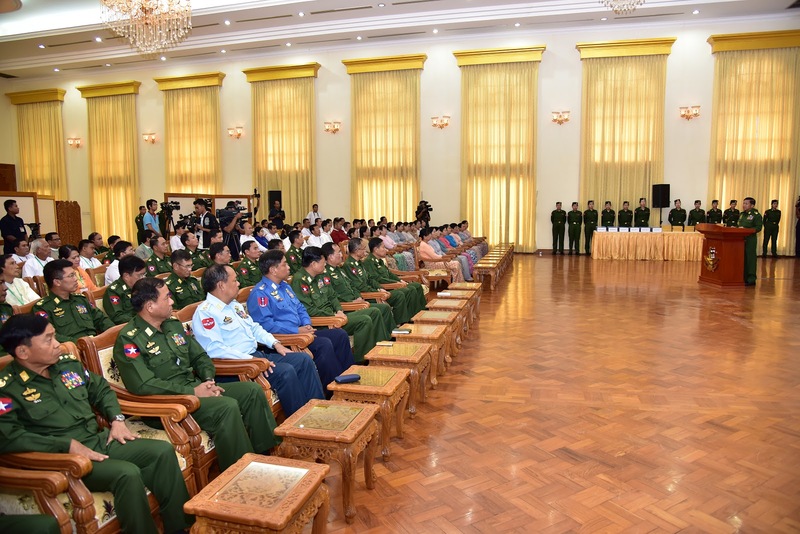 As to the development of Rakhine State, the Senior General said, the state is rich in natural resources and the government is taking regional development measures. Job opportunities are also being created by inviting investment. There must be cooperative efforts to ensure that the people in Rakhine State have peaceful living conditions. The local people for their part need to return home and try to develop their region. There are many losses and tragedies in the aftermath of the incidents. Cooperation is necessary to remedy them as quickly as possible while efforts must be made for regional development. The Senior General then praised today’s well-wishers for their compassion and nationalistic fervor , praying for them to have such a spirit forever. The ceremony was attended by Commander-in-Chief of Defence Services Senior General Min Aung Hlaing and wife Daw Kyu Kyu Hla, Deputy Commander-in-Chief of Defence Services Commander-in-Chief (Army) Vice-Senior General Soe Win, Union Ministers Lt-Gen Sein Win and Lt-Gen Ye Aung, Chief of the General Staff (Army, Navy and Air) General Mya Tun Oo, Commander-in-Chief (Navy) Admiral Tin Aung San, Commander-in-Chief (Air) General Khin Aung Myint and senior military officers, parliamentary representatives, Yangon Region Minister for Rakhine Ethnic Affairs U Zaw Aye Maung, members of Arakan National Party and donors. 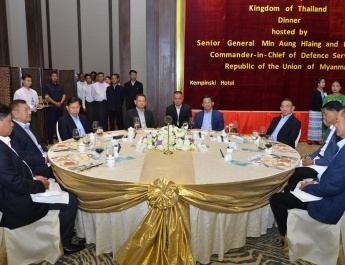 Then, Senior General Min Aung Hlaing accepted Ks-500 million donated by Kun Kho Yar Foundation, Ks-300 million by Brighter Future Foundation, Ks-100 million by Ayeyawady Foundation, Ks-50 million by Kyei Nilar Co, Ks-30 million each by Amazing Group Co, Aung Myin Thu Co,Sky One, Lucky Man Co, Authentic Co, and K T Development Co and Ks-20 million by Naungtong Co.
Adjutant-General Lt-Gen Hsan Oo accepted Ks-5 million donated by family of the Commander-in-Chief of Defence Services. 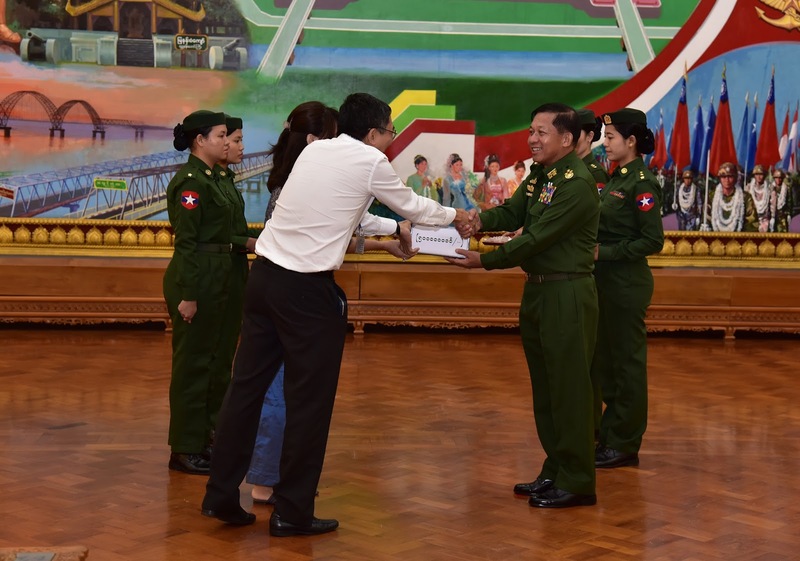 Then, Deputy Commander-in-Chief of Defence Services Commander-in-Chief (Army) Vice-Senior General Soe Win accepted Ks-24 million donated by families of the Office of the Commander-in-Chief (Army), Ks-295.89 million by families of the Defence Services (Army, Navy and Air) and other well-wishers, Ks-77.5 million by Union of Myanmar Economic Holdings Ltd and partner companies, Ks-60.2 million by Myawady Trading and partner companies, and Ks-50 million each by Miya Win International Ltd, CB Bank and IGE Group. Afterwards, Chief of the General Staff (Army, Navy and Air) General Mya Tun Oo accepted Ks-32.15 million donated by partner companies of the UMEHL (Head Office), Ks-30 million by Eden Group,Ks-17.9 million by partner companies of Myanmar Brewery Enterprise, Ks-16 million by joint venture companies of UMEHL, Ks-30 million by Myanmar Combiz, Ks-10 million by Myint Tet Co, and Ks-7.1 million by partner companies of Silver Sea Livestock Breeding and Fisheries Co.
Commander-in-Chief (Navy) Admiral Tin Aung San accepted Ks-31.1 million donated by well-wishers, Commander-in-Chief (Air) General Khin Aung Myint, Ks-14 million and Minister for Rakhine Ethnic Affairs U Zaw Aye Maung, Ks-5.1 million and packages of instant noodle worth Ks-1 million. After the ceremony, the Senior General cordially greeted those present. Today’s cash donations made by families of Defence Services (Army, Navy and Air) and well-wishers amounted to Ks-1,942,540,000.